Died: March 18, 2011, Camp Lemonier, Djibouti, Operation Enduring Freedom – Horn of Africa. Unit: 6th Battalion, 4th Military Information Support Group, U.S. Army Special Operations Command, Fort Bragg, N.C.
Master Sgt. Jamal H. Bowers, 41, of Raleigh, N.C., died March 18 at Camp Lemonier, Djibouti, as a result of a non-combat related incident. He was assigned to the 6th Battalion, 4th Military Information Support Group, U.S. Army Special Operations Command, Fort Bragg, N.C. He died of natural causes due to a medical condition. He is survived by: his wife, Kawana; children, Jamal Bowers II, Surita Bowers, Clarice Kimp and Denise Kimp; parents, Leroy and Mary Bowers; brother, Leroy Bowers Jr; sisters, Leona Germaine, Lenore Bowers and Yolandia Bowers; grandmother, Rose Gallman; two grandchildren and a host of other relatives and friends. Mark Schulz, a spokesman for Camp Lemonier said that Master Sgt Bowers was found dead Friday at the camp. Bowers had been feeling ill the day before and had been sent home and the death appeared to be medical in nature. Jamal Bowers had previously been a U.S. Marine and joined the Army in 1999 as a combat engineer. In 2001, he was qualified in psychological operations, and he had worked as an instructor at the psychological operations qualification course at the John F. Kennedy Special Warfare Center. Master Sgt. Jamal H. Bowers' awards include the Bronze Star Medal, Meritorious Service Medal, a posthumous Meritorious Service Medal, a Navy Achievement Medal with Valor, Army Commendation Medal, Army Achievement Medal, Good Conduct Medal, National Defense Service Medal, Iraqi Campaign Medal and Global War on Terrorism Medal. "Army Staff Sgt. Jamal H. Bowers was cited as a tactical psychological operations team chief in Fallujah, Iraq. Bowers was recognized for leading his team during many days under direct fire from enemy forces in Fallujah, the citation stated. "After his platoon was ambushed, he immediately led an attack on the enemy and provided for the evacuation of three wounded Marines," the citation noted. "His tactical skills and courage under fire were essential to destroying the enemy and saving the lives of his wounded comrades." 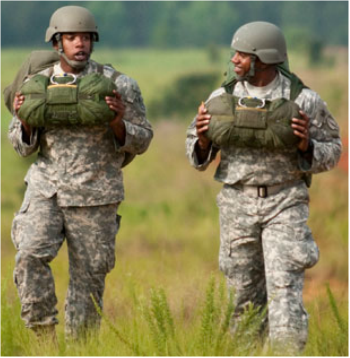 Last summer Fort Bragg's newspaper, Paraglide, published an article featuring Master Sgt Bowers and his son, Private 1st Class Jamal Bowers II who participated in an airborne operation supported by 4th POG as a bonding experience. Jamal II was the second jumper out the aircraft followed by his father. They floated down together just yards from each other and shared the long walk off the drop zone. This jumped marked over 40 jumps total for Jamal I and it was Jamal II’s eighth jump since completing Airborne School in April of 2009.